Turn north from Burbank Blvd. (or south from Victory Blvd.) onto Woodley Ave., which is ½ mile west of the San Diego Freeway (I-405). Travel about ½ mile to the sign for the Wildlife Reserve (and Japanese Gardens). Turn east onto Wildlife Way, a park road. Bear right at the immediate fork in the road and go east ½ mile to the Wildlife Reserve parking on your left. The Wildlife Reserve is to the south...follow the trail down from the restrooms area. To use online mapping programs, use 6100 Woodley Avenue, and that will take you to the park road (“Wildlife Way”) leading to the Wildlife Reserve’s parking lot at the road’s east end. Park in the lot, then walk south past the monumental rocks and restroom building to the amphitheater. Follow the trail leading from the "stonehenge" restroom/amphitheatre area south towards the entrance to the Wildlife Reserve. You can walk all the way down to the LA River, but if you do (the trail leads through a tunnel under Burbank Blvd.) be sure to go with another person. Join us on San Fernando Valley Audubon’s renowned birds-and-nature walks for families and beginners. 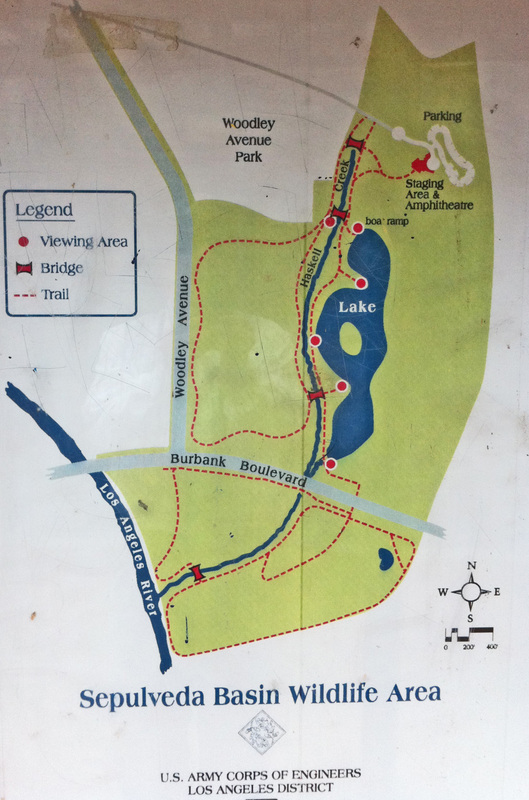 Stroll through the lovely Sepulveda Basin Wildlife Reserve with a guide, enjoying its trails and wildlife lake. Many kinds of birds are found here, along with lizards, cottontail rabbits, butterflies, fish and more. Learn about the plants and birds and see them up close. Learn why this is a special place. These Walks are for families with school-age children and beginning birdwatchers, including first timers. Time and Meeting Place: The Wildlife Area entrance and amphitheater are in the southeast part of Woodley Park. Meet at the amphitheater at 9:00 AM. Directions: Driving on Woodley Ave. north from Burbank or south from Victory Blvd., go ½ mile and turn east at the sign for the Japanese Garden. Continue straight (don’t turn into the garden) and drive past the Cricket Fields and around the tree in the middle of the road, on to the parking lot at the end of the road. Meet at amphitheater. GPS coordinates to parking: 34.179942,-118.472595. Equipment and Clothing: Wear sturdy shoes and layered clothing. A cap or hat with a brim is suggested. We have binoculars to loan or you can use your own. More Information: Muriel Kotin at 310.457-5796, Diana Keeney at 818.998-3216 or visit San Fernando Valley Audubon's website www.sfvaudubon.org. Reservations are not needed except for large groups. Heavy rain cancels. This website is sponsored by the Sepulveda Basin Wildlife Areas Steering Committee (SBWASC) that has been meeting monthly since June 1990. The purpose of the Committee is to advise the City of Los Angeles Department of Recreation and Parks concerning the operation, maintenance, and improvement of the existing wildlife areas and any future expansion thereof. The Committee may also make recommendations on matters concerning flora, fauna, and other natural resources in other areas within the Sepulveda Basin, such as the Los Angeles River and its tributaries, park land, and open spaces. The membership of the Committee is comprised of organizations with a demonstrated interest in flora, fauna, and other natural resources within the Sepulveda Basin. See the bottom of this page to see the logos of the member organizations and other affiliated agencies, or click the tab at the top of the page. Minutes of the SBWASC can be found here. Regular meetings of the Committee are held every other month generally on the fourth Tuesday at 6:30pm, at the Valley Region Headquarters of the Dept. of Recreation and Parks, 6335 Woodley Avenue, Van Nuys, CA 91406. See “Upcoming Events” on this page for next meeting. Turn north from Burbank Blvd. (or south from Victory Blvd.) onto Woodley Ave., which is ½ mile west of the San Diego Freeway (I-405). Travel about ½ mile to the sign for the Wildlife Reserve (and Japanese Gardens). Turn east onto Wildlife Way, a park road. Bear right at the immediate fork in the road and go east ½ mile to the Wildlife Reserve parking on your left. The Wildlife Reserve is to the south...follow the trail down from the restrooms area. To use online mapping programs, use 6100 Woodley Avenue, and that will take you to the park road (“Wildlife Way”) leading to the Wildlife Reserve’s parking lot at the road’s east end. Park in the lot, then walk south past the monumental rocks and restroom building to the amphitheater. Follow the trail leading from the "stonehenge" restroom/amphitheatre area south towards the entrance to the Wildlife Reserve. "Therefore the following rules and/or regulations will be enforced within the Wildlife Area by City park rangers and City police. These rules will be incorporated in appropriate public use information signs and posted at the entrance and appropriate locations with the wildlife area. 1. Public use shall be allowed on the Wildlife Area during daylight hours only. 2. Camping, open fires, and the use of gas cooking stoves on the Wildlife Area is prohibited. 3. All visitors shall remain on the designated trail. There will be no public access to the east side of the wildlife lake to prevent disturbance to wildlife. 4. 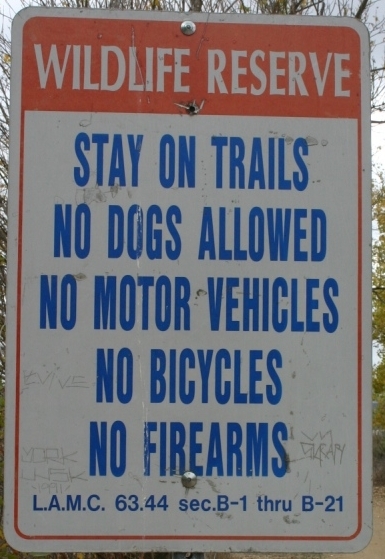 Bicycles, skateboards, or rollerskating will not be allowed in the Wildlife Area. 5. No person shall drive, operate, leave or stop any motor vehicle, off-road vehicle, or tractor in the Wildlife Management Area except for maintenance vehicles. 6. No person shall swim, wade, or dive within the Wildlife Area. 7. No person shall launch or operate a boat or other floating device within the Wildlife Area. 8. No person shall disturb or take any bird, nest, or eggs thereof, or any plant, mammal, fish, mollusk, crustacean, amphibian, reptile or any other form of plant or animal within the Wildlife Area. 9. No person shall possess, fire or discharge any firearm, bow and arrow, air or gas gun, spear gun, or any other weapon of any kind within or into the Wildlife Area. 10. Individual user permits will not be required; however, a visitor sign-in booth will be located at the entrances and will be maintained by the City. 12. The release of any fish or wildlife species, domestic or domesticated species, or the introduction of any plant species, is prohibited. 13. The feeding of wildlife is prohibited. 14. Pets, including dogs, cats and horses are prohibited from entering the Wildlife Area." The mission of the Committee shall be to oversee, in its advisory capacity, the wildlife refuge areas and other areas of present or potential natural value within the Sepulveda Basin, as well as to support policies and programs that ensure their long-term preservation, protection, and enhancement. Article 3, Section 63.44 of the Los Angeles Municipal Code contains Regulations Affecting Park and Recreation Areas. 63.44 B-2 mandates that all dogs be on a leash less than 6 feet long, B.8. 'No person shall land, release, take off or fly any balloon, except children toy balloons not inflated with any flammable material, helicopter, parakeet, hang glider, aircraft or powered models thereof, except in areas specifically set aside therefor, B-10 prohibits bows or crossbows, B-11 prohibits the take/seizure/hunting of all birds/animals/fish, B-12 bans the removal of wood/plants/rocks/soil, B-13 makes it illegal to deface any property (including plants), B-14 prohibits all loitering between 10:30 PM and 5:00 AM, B-16 prohibits all human or motor powered vehicles (except on trails or roads specifically for that purpose), B-17 bans all fires, B-19 prohibits littering, B-21 bans firearms. For CF&W, a recording will come on and give you a menu. PRESS ZERO for the operator and the operator will ask for the "violation in progress" and your location and transfer you to the applicable Fish and Game division department. State that Warden Kory Collins is in charge of the area and should be notified of the problem. All property within the Sepulveda Flood Control Basin is owned by the Los Angeles District Corps of Engineers, but more than 80% of the land is leased out for recreational and agricultural uses. Sepulveda Dam, completed in 1941, is a dry-land reservoir, with the purpose of controlling runoff from nearby San Gabriel, Santa Monica, and Santa Susana Mountains. 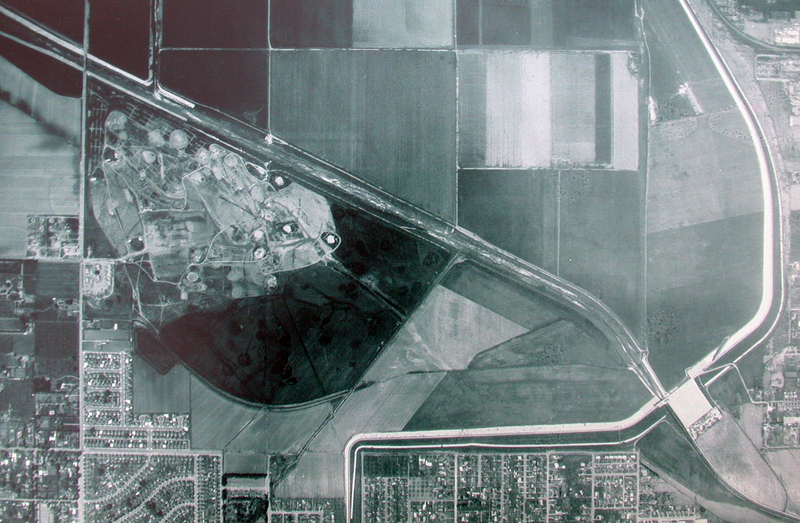 Besides the Encino and Balboa golf courses, the Balboa Sports Complex, and the model airplane field, most of the Basin was devoted to agriculture (corn and then sod farms). In the mid-1960’s, Burbank Blvd. was extended across the Basin. In the 1970’s the City of Los Angeles Bureau of Sanitation built the Donald Tillman Water Reclamation Plant within the Basin (over the objections of the Corp of Engineers). In March of 1981, a revised Master Plan for the area was adopted. At the time, of the 2,150 acres in the Sepulveda Basin, approximately 1,060 acres were committed to recreational uses. The updated Master Plan designated an additional 540 acres for future recreational uses. Included in the plan are provisions for the commitment of approximately 220 acres of land to informal park space, 120 acres for development of a recreational lake, 108 acres for a wildlife management area, and 60 acres for an “arts park” that has been subsequently redesignated for a “sports complex” (the area west of Balboa Blvd. just north of the Los Angeles River. 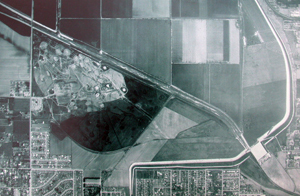 In 1979 the Corp of Engineers developed the first area of the Wildlife Reserve (formerly called the South Reserve), an approximate 48 acre parcel located south of Burbank Blvd and bordered by the Los Angeles River and the Sepulveda Dam on the east and south. A “pothole” pond (fed with piped-in fresh water) was created, and vegetation representing coastal sage scrub and riparian woodlands were planted. This area was drastically altered in December 2012 and as of January 2013 there were ongoing negotiations between environmental groups and the Army Corps of Engineers (see section above below upcoming events). featuring an 11-acre lake with an island and wildlife viewing stations. Various revegetation projects have been undertaken since then. above, the stone monuments we call "stonehenge." the reserve entrance and restrooms. 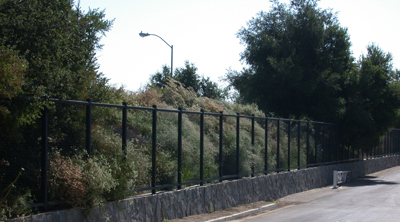 with California native plants and is the largest native landscaping project developed by the City of Los Angeles. above, the berm surrounding the Water Reclamation Plant. In 1994, the City and Federal governments agreed to sharing the costs on $11 million in improvements in the Sepulveda Basin. The wildlife are was expanded 110 acres to the west of Haskell Creek (on either side of Woodley Avenue). Additional facilities in the wildlife area included trails, restrooms and staging area, signs, benches, viewing blinds and parking. This project was completed in 1999. Web page and design by Justin Baker. Text and captions by Steven L. Hartman. All photographs taken in the Sepulveda Basin by Steven L. Hartman unless otherwise noted.